Not many people like em' and a lot of people are allergic to them, but boy do we depend on them. I am talking about the honey bee. I recently came across an article that explains the possible collapse of the $30 billion a year U.S honey bee industry. This will mean much more to our food industry than just honey alone. 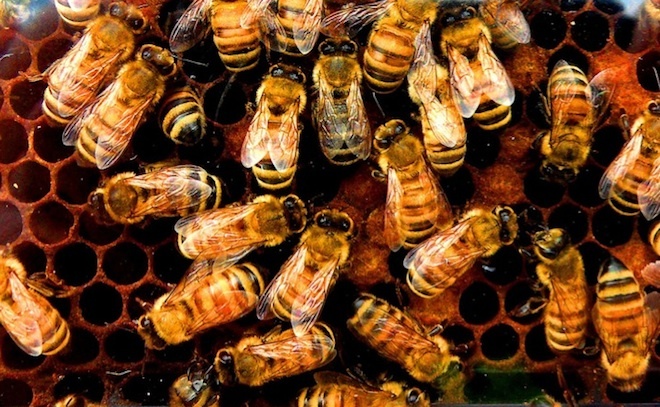 Many of you may not know but these bees are responsible for the pollination of many of our nation's crops. From apples to zucchini, pollination is crucial, and we need these buzzing transporters to help our country produce the food we consume. According to scientists, they are continuing to struggle to find the cause of the CCD or Colony Collapse Disorder that is involved with the honey bee. It is spreading at a rapid pace and is causing quite a bit of concern. One analysis can be traced to the chemical neonicotnoids... others cite parasites or poor nutrition. Whatever it is, it is being considering an all out "bee-mageddon." It has already destroyed millions of hives over the course of the last 5+ years. The last two being the worst. A 30% death rate in the bees can be worth more than $2 billion to our economy. Back in the 1940s there were 6 million colonies in the our country. Now we are down to less than 2.5 million. It not only affects the honey we take for granted from their combs, but their pollination is required by numerous crops. One example that the article goes into detail about is the almond. Apparently you can not grow this nut without honey bees, and the state of California actually accounts for 80% of the world's almonds harvest. 40% of the 2.5 million bee hives out there are required to pollinate these almonds alone. This could be a food disaster if the supplies continue to deplete, and not just involving the almond. Many nuts, berries and other crops will feel the affect. There have been efforts to breed better bees to handle the causes of CCD but there are still no concrete results. This reduction of the honey bee supply puts us yet in another dilemma that will affect us all. Click here for another article on the topic.